Samford University World Languages and Cultures Professor Emerita of Spanish Myralyn F. Allgood has published a new book that celebrates almost three decades of Samford’s role in the Rio Grande mission program founded by Elmin Howell. Summer Missions on the Rio Grande: A Collective Memoir of Samford Students in Ministry, 1975-2003 was a labor of love for Allgood, who first visited Texas 40 years ago this winter to learn how Samford students might participate in the program. here and there—a student’s journal entry, a casual word between friends, encounters with River Ministry alumni over the years—there has been an ongoing echo of the same theme: ‘Señora, when are we going to write a book about all this?,’” Allgood wrote in her preface to the book. That question led Allgood to a three-year exploration of the materials and memories that became the book. It was an enormous task, but Allgood kept faith in its importance. “I think we all sensed from the outset that God’s hand was on this project, and watching Him move in the lives of those involved was a remarkable thing to behold—and to recount,” she wrote. Howell, former Samford professor Max Gartman and Howard College dean David Chapman also contributed new writing, but the book focuses primarily on alumni reflections, newsletters, correspondence, candid photos and news clippings, most reproduced in their original forms to create the appearance of a scrapbook. Howard College of Arts and Sciences helped fund the book’s production. To celebrate the publication, the college will host two free public receptions April 9 (3 p.m. or 7 p.m.) in Samford’s SIM Forum, inside the east entrance of Brooks Hall. Books will be available for purchase ($10 for RM alumni, $20 for others) and Allgood’s autograph at the receptions. 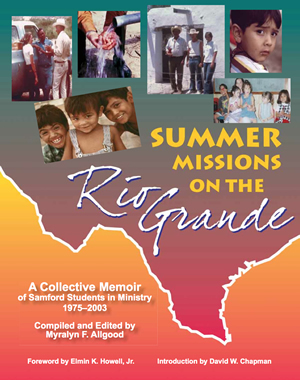 Autographed copies of “Summer Missions on the Rio Grande” are available in Samford’s bookstore. The book may be purchased online without the RM alumni discount, but is available by mail with the discount (plus $7 shipping) by calling 205-726-2834.